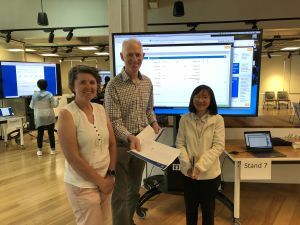 DME was well represented at the recent Digital Literacy Show and Tell Event hosted by the Melbourne Graduate School of Education and Scholarly Services. Dr Lisa Cheshire and the Education Technology Team showcased the Electronic Health Record feature of MD Connect while Professor Clare Delany and colleagues displayed the Online Qualitative Journeys learning and teaching resource. Both resources attracted interest from those attending the event.